A moment nearly six years in the making. 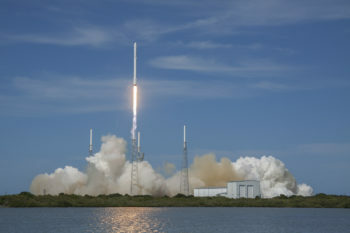 Fire and flame returned to the historic LC-39A launch pad at the Kennedy Space Center as SpaceX conducted the static fire of its Falcon 9 rocket tasked with lofting the SpX-10 Dragon resupply mission to the International Space Station. 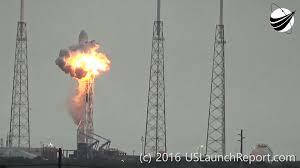 The ignition of the Falcon 9’s engines occurred at 16:30 local time on Sunday, 12 February – marking the first time since the Space Shuttle Atlantis left Kennedy on 8 July 2011 that the sound and thrust of rocket engines have graced pad 39A. 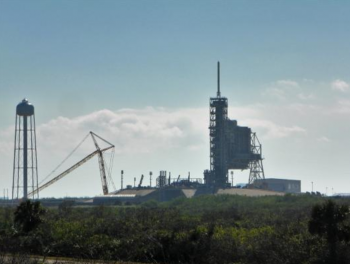 LC-39A was already deep into its reconfiguration – more accurately described as a complete rebuild – for the Falcon rocket family at the time of the AMOS-6 static fire mishap on 1 September 2016. At the time of AMOS-6, Pad A was nowhere near the top of the priority list for SpaceX, which was marching through – at a quick cadence – its 2016 launch manifest with SLC-40 at the Cape Canaveral Air Force Station. At the time of the mishap, SpaceX had hoped to have LC-39A at the Kennedy Space Center (KSC) “ready” to host its first Falcon mission by November 2016. Once the AMOS-6 accident occurred, the readiness of 39A quickly catapulted to the top of the priority list for SpaceX as the company completed its investigation into the static fire RUD (Rapid Unscheduled Disassembly) and successfully returned the Falcon 9 to flight with the Iridium NEXT mission in January 2017 from Vandenberg Air Force Base in California. 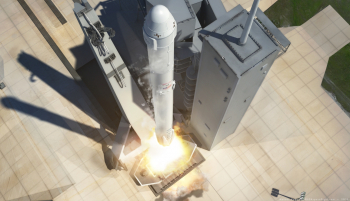 While LC-39A – from the Shuttle era – contained elements SpaceX could use, such as a flame trench, a launch pad, and a sound suppression system, extensive modifications to the pad had to be made to accommodate the Falcon 9 and Falcon Heavy rockets. Perhaps the most visible of these changes involved the construction of the Horizontal Integration Facility (HIF) on top of the former crawlerway inside the pad perimeter gate as well as the installation of rainbirds to douse the pad and rockets with sound suppression water. Additionally, electrical connections, data cables, propellant feed lines, and a host of other reconstructive efforts had to be undertaken at the pad to accommodate the Falcon rocket family. In essence, SpaceX was constructing an entire new pad at KSC – with the physical, aboveground features of 39A remaining largely as they were at the completion of the Shuttle program – with the Fixed Service Structure (FSS) and portions of the Rotating Service Structure (RSS) still standing. Moreover, a unique element that has drawn attention to Pad A’s readiness to host a Falcon rocket is that the pad itself is the critical item in determining when the first Falcon flight from 39A can occur. Normally, delays in development and construction of a rocket outpace the delays to pad construction, verification, and validation. In this case, the use of LC-39A and the delays to its readiness were thrust into the spotlight after AMOS-6. Nonetheless, the SpaceX team is to be commended for the superb and time-consuming work they have undertaken at the pad. In the last two weeks, highly visible progress toward pad readiness occurred – following the pad’s earlier “completion and activation” for verification and validation testing. In late January, the Transport/Erector/Launcher (TEL) went vertical at the pad for the first time – testing connections and the new “throwback” release feature (which sounds more dramatic than it will be in reality) that will debut with SpX-10 in which the TEL will retract at T0 instead of earlier in the count as it has on all other Falcon 9 launches. 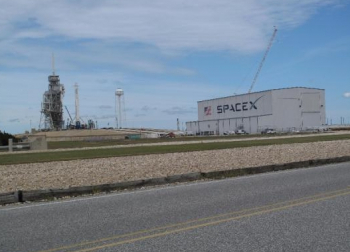 With those tests complete, SpaceX continued to tweak and refine the pad and TEL. By 5 February, workers and engineers were into final documentation and validation of Pad A – an internal review process to confirm that the pad was indeed rocket ready. At the same time, the first and second stages of the Falcon 9 were mated together in the HIF by the night of 6 February, with the TEL moving into the HIF on the 8th for mating to the Falcon 9. On 7 February, SpaceX formally amended their request to the Eastern Range for the date of the static fire, moving it from Wednesday the 8th to Thursday the 9th within a window of 1600 EST – 2200 EST. Curiously, SpaceX also requested a backup opportunity for Friday the 10th during the same 1600 – 2200 EST time window. That window was subsequently extended through midnight local time. However, the attempt was then moved to Saturday for unknown reasons, with the window opening at 1000 EST. 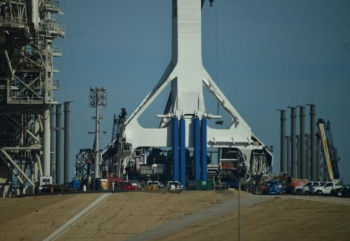 SpaceX engineers still used Friday to maneuver the vehicle to the vertical position to allow for final checks ahead of Saturday’s planned fueling. The reason for the close-to-static-fire postponements likely stemmed from the fact that once the Falcon 9 was mated to the TEL in the HIF, it then had to be transported up the ramp of 39A, positioned to vertical, and connected to the pad – at which point a whole new series of tests that could only be performed once a Falcon was on the pad could begin. Saturday’s attempt then suffered an unknown set back, resulting in the test moving to Sunday. As with any new launch pad, identification and fixes of anomalies are to be expected. During Sunday’s attempt, two issues required work ahead of what was an eventual 16:30 EST firing of the Falcon 9’s engines for 3.5 seconds – later confirmed by SpaceX. Ahead of the test, security notices to all KSC personnel announced that security would set up roadblocks to the LC-39A and 39B areas. This followed the expected and previously announced closure of Pad B for the static fires and launches of the Falcon 9 from Pad A. The initial notice stated that Pad B would be closed all day for static fires and closed during the launch periods for all Falcon 9 missions from LC-39A. A subsequent release noted the exact reasons why 39B would be closed for the events. While this alone would not be enough to close Pad B for static fires, the only roadway accessing Pad B lies right at the edge of the 5,100 foot radius around LC-39A that is the “SpaceX keep out zone” for the static fire as coordinated by SpaceX and the Federal Aviation Administration. For reference, the same document reveals that the Blast Danger Area (BDA) for the static fire is a 2,700 foot radius around Pad A – which does not come close to Pad B. The document, while only encompassing the static fire, did lend some explanation for why Playalinda Beach, located north of LC-39A, was to be open to the public for the static fires and launches of Falcon 9’s from Pad A – though that was changed Thursday, and the beach will now be closed for both events. For every Space Shuttle launch, Playalinda Beach was a restricted area as it lay within the BDA for the Shuttle; however, since Falcon 9 has a much smaller BDA, the beach was originally to have remained open for Falcon 9 launch viewings. A subsequent risk assessment determined that closing the beach was the better option. Moreover, the document confirms that the KSC Emergency Operations Center will be active and will monitor the static fires of Falcon 9s from Pad A. For the SpX-10 static fire, once the Falcon 9 was vertical on Pad A and its electrical, data, and propellant connections were secured and tested, the vehicle performed a standard countdown with the SpaceX launch team to verify all of the connections and propellant flow capabilities for the new pad. The countdown culminated with a 3.5 second firing of all nine Merlin 1D engines at the base of the Falcon 9 first stage. After the engine firing occurs, the teams will move into post-fire securing operations, safing the vehicle before de-tanking it and rolling it back to the HIF for payload mate. At the beginning of the week, SpaceX and NASA had been targeting a launch date of 14 February during an 1131-1136 EST window for the CRS-10 mission to the International Space Station. However, that date subsequently moved to a new official target date of 18 February due to a range conflict. The conflict, curiously, was not with the ability of the Falcon 9 to launch but rather with the ability of the first stage to return to Landing Zone 1 (LZ-1) back at the Cape. While the precise nature of the conflict is not known, it is understood that a portion of the range asset necessary for the Falcon 9 first stage’s return was already spoken for by another customer during the period of the 14-17 February. In coordination with NASA, SpaceX slipped the launch to the 18th to ensure that the first stage could indeed return to the Cape. Liftoff is currently set for 1001 EST on 18 February. Flames last touched LC-39A on 8 July 2011 during the final flight of the Space Shuttle Program. After that, Pad A lay dormant, with its immediate future clouded in uncertainty as NASA searched for commercial companies who might wish to take possession of the pad – which NASA had deemed largely unnecessary for the Space Launch System program less the use of its LH2 storage facility for the massive BEO (Beyond Earth Orbit) rocket’s hydrogen fuel supply. 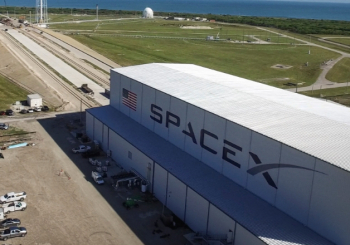 This uncertainty persisted for three years until the formal signing of documents that triggered the beginning of a 20-year lease of pad 39A and its facilities to SpaceX on 14 April 2014. With all eyes now on SpX-10 and the first SpaceX flight from 39A, the pad is also set to host in 2018 the historic first launch of humans aboard commercial rockets as well as the first human-rated spacecraft to Mars. With this, SpaceX will add to the impressive career of 39A that stretches back to 1962. In May 1961, when President Kennedy announced the goal of “landing a man on the moon and returning him safely to Earth” before the end of the decade, it quickly became evident that the existing pads at the Cape Canaveral Air Force Station would not be sufficient for the mighty Saturn V rocket. In 1962, NASA entered into agreements to acquire 218 square miles of land upon which the Launch Operations Center, subsequently renamed the Kennedy Space Center following President Kennedy’s assassination, was constructed. 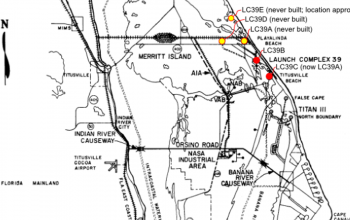 Originally, the plan for KSC called for three launch pads, with the launch complex itself officially named Launch Complex 39 and its pads receiving alphanumeric designations of “A” to “C” – with 39A being the northernmost pad and 39C being the southernmost. 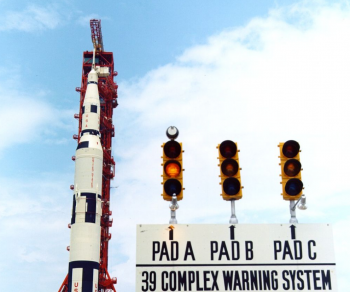 As less funding than expected materialized, plans for the original 39A were scrapped, and NASA pursued a two pad system that reorganized the pad numbering system. 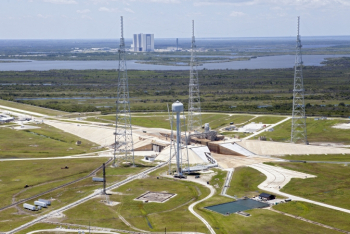 Thus, the southernmost pad – which entered its construction phase first – became pad 39A instead of 39C. Construction workers completed Pad 39A in 1965 and final outfitting proceeded into 1967. On 26 August 1967, Pad A received its first rocket – the Apollo 4 Saturn V.
With the launch of Apollo 4 came the first of 94 launches from Pad A to date – 12 for Apollo and 82 for Shuttle. Through those 94 missions, none was as historic as the pad’s use on 16 July 1969 to launch Neil Armstrong, Buzz Aldrin, and Michael Collins on Apollo 11 for the first human lunar landing. 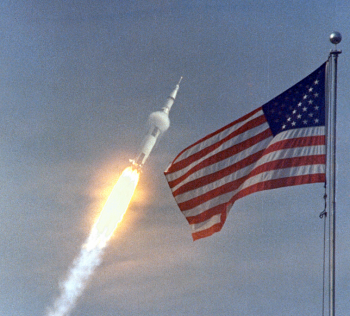 Following the launch of all the crewed Apollo lunar landing missions, Pad A then hosted the launch of the U.S.’s first space station, Skylab, on 14 May 1973. With the launch of Skylab (the last un-crewed launch to occur from Pad A), the pad was deactivated and formal preparations to transform it into a standing structure model for the Space Shuttle began. 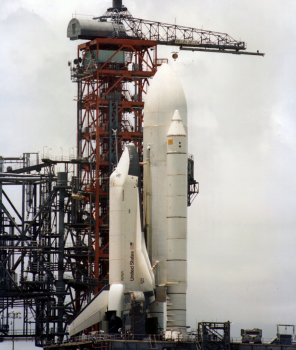 In 1979, 39A hosted its first Space Shuttle stack as the Shuttle Enterprise arrived for fit checks and validation and verification efforts that could only be achieved with a Shuttle at the pad. The use of Enterprise for these checks made Pad A the only pad to host all six Shuttle Orbiters. The Space Shuttle era then began from the pad on 12 April 1981 – with Pad A hosting the inaugural flights of Columbia, Challenger, Discovery, and Atlantis. The pad hosted the first 24 Shuttle missions in exclusivity – from STS-1/Columbia to STS-61C/Columbia. Pad A also hosted the very first construction flight of the International Space Station (Endeavour’s STS-88 mission in December 1998) as well as the mission which completed U.S. assembly of the Station – Endeavour’s STS-134 mission in May 2011. Sadly, Pad A’s history includes tragedy, as the pad was the launching point for the Columbia and her crew on 16 January 2003 on STS-107. 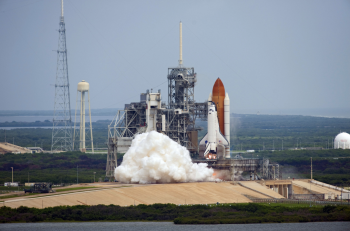 Then, as it did at the beginning of the Shuttle program, Pad A hosted the final 18 Shuttle missions in exclusivity – from STS-117/Atlantis to the emotional final flight of STS-135/Atlantis. Through all of this history, Pad A has been a single user, single spacecraft launch platform. While SpaceX’s exclusive lease will keep LC-39A as a single user pad, it will now serve two variants of the same rocket family – the Falcon 9 and the Falcon Heavy. But more importantly, SpaceX’s lease of the pad and its upcoming inaugural launch for a commercial company officially makes the Kennedy Space Center a multi-user spaceport – a prime goal of the facility following the retirement of the shuttle fleet.